When searching for fun places that we could reach by car from Charleston, we stumbled on Bolt Farm Treehouse. There’s always something extra special about staying a night or two in a house that’s attached to trees but this place in particular was amazing. 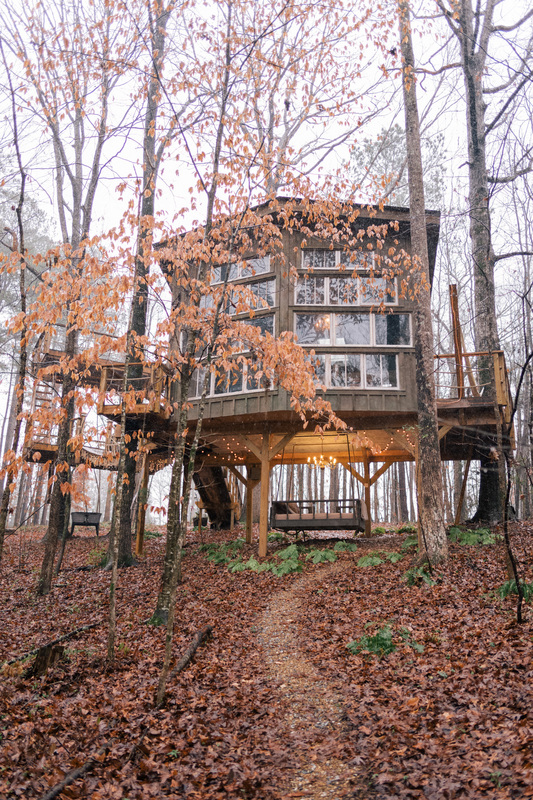 Located not too far from Clemson in the foothills of South Carolina, this glamping treehouse is listed on Airbnb as one of the best places to stay in the whole state! They’re booked up pretty solid, but we emailed a while ago asking to get on a “wait list” for cancellations (which they recommend to do) and last minute they messaged us back letting us know two nights had popped open for the end of last week. We of course, jumped at the chance and before we knew it, we were road tripping up North. With no tv and no internet it’s meant to be an escape from our always-on digital world. And while in reality that sounds like heaven to me, I have a much harder time shutting off than I would like to admit. Our first night we picked up wine with some bread and cheese, choosing to enjoy our meal under an outdoor chandelier and strings of lights hanging everywhere. It was the complete opposite of NYC, which is where we had just come from. We ended up calling it a night way earlier than we had done in a long time. The next morning we woke up to pouring rain that carried on the entire day. Usually some rain would put a damper on our plans, but we took the opportunity to start our morning slow, enjoying some toast and coffee and keeping warm by the fire. We stayed in our pjs until the late morning, catching up on off-line work, listening to some podcasts and creating action plans for our goals this year. It actually made me really grateful to have the chance to unplug and still work in a different way than we normally do. After finally growing restless from being inside all day and with our plans for hiking not ideal, we headed downstairs to the cozy bed swing underneath the house. It happened to be the only spot outside dry enough to enjoy the great outdoors while not getting soaked. A good book and a hot drink while listening to the rain is my ideal afternoon. Before we knew it, we were packing up and heading back to Charleston…just as the sun started to come out! Oh I love 💗 this little tree house get away … such a cute and relaxing way! Love 💗it! Wow, this is the perfect place for a getaway! Your getaway looks so nice! You can stay in some treehouses around England and I’ve always considered it, but after seeing your time away I think I’ll definitely have to take the plunge! It looks so nice! This is such a dreamy location and so damn beautiful! Omg, this is like a childhood dream coming true!! Beautiful photos, incredibly dreamy place and such a lovely, cozy vibe! Wow it looks like a wonderful getaway dear! I am sure you enjoyed a wonderful time :) your rainy look is one of my faves – you look gorgeous! WOW!! So whimsical and romantic!! Woow, it looks like something from Disney movies! So picturesque! This is the cutest treehouse I’ve ever seen! Plus it looks so romantic! I hope you enjoyed this little gateaway! This place is amazing, love it there. Looks like such a cool spot to stay, Airbnb has some really unique finds! Too bad the weather wasn’t ideal but you made the best of it, sounds like a great place to relax even if you have to stay inside. The bright and cheery colors help to liven up the raininess too! So beautiful and strange! I bet this place would be amazing in the spring. This looks like it came out of a fairytale! I want to visit it ASAP! This looks like such a wonderful getaway! I definitely need a weekend like this with my husband! I’m sorry you didn’t get your hike in! But it seems like you needed the R&R with your hubby to recharge. Your outfit are on point! This place is absolutely amazing! What an incredible little getaway. So glad you all enjoyed and were able to unplug a bit. These photos look incredible! Love it! This is seriously so cool! I wish we had something like that here. I’m obsessed with this! Adding this to my bucket list ASAP! Great pictures, what camera/lens is used? Oh my word! That tree house looks amazing! It sounds like a dream. Simplicity and away from people are my kind of trips. I definitely need to check airbnb for more places around my area. Omg this is the cutest treehouse ever! This makes me want to have a getaway there! Love the loafers. I’m getting that for spring. That looks like such a neat getaway! I love you luggage! What a gorgeous place to stay! It’s nice to disconnect for a bit and take in the present moment. I am sure you and Thomas enjoyed quality time together not having to work. A treehouse! How adorable! Recently I was searching for AirBnB’s and found the cutest tiny house located in Tampa, FL. Can you believe that NONE of my friends wanted to go on an adventure and stay there? It’s on my summer bucket list, I just need to find a friend to go with me! The place is super modern, has two beds and can sleep 4 people. That’s so amazing to me. How fun you got to go on a last minute adventure! Those are the kind of memories you remember forever! Looks like such a fun place! No wonder it’s always booked. Wow, I love the idea of staying in a tree house! It seems like it would be so much fun and your photos are so picturesque! OMG! This is just adorable! how lovely! That looks so nice and relaxing! I really like the vintage feel! No internet and phone usage is a great way to relax. :) Thanks for sharing! This looks like a dream getaway. I would love to stay there one day. I hope you had a lovely time! So darling! Absolutely love discovering all these places through your eyes/camera lens! Oh my goodness- Bolt Farm Treehouse has been on my bucket list for quite some time now. So glad you were able to get a reservation! Do you know about the folks who own it? Seth Bolt is the bassist for NEEDTOBREATHE, a fantastic southern rock band from SC. It’s absolutely worth checking out their albums on iTunes. Gorgeous pictures! What an amazing place! Super lucky you got to spend a weekend there. Beautiful photos! That treehouse is definitely giving me major wanderlust, and those sweaters are great winter outfit inspo. Love all of it! This looks like such a fun place to stay! How fun! Love all of these photos. Wow this treehouse is amazing! <3 I love the quaint, classic vibes! :) Soooo beautiful! And I'm loving the nighttime view so much too! Definitely bookmarking this for a future trip! It looks so cosy and fancy somehow all at once! Such a good idea to put yourself on a wait list, I never thought to email and do that! Thanks for the tip. Offline time sounds good right about now! And love the rainbow knit! So cute! such an espectacular photos and outfits, the place looks perfect. Great post! LOVE THIS! So dreamy.I’ll but it on my list to visit when I go there! I follow your blog a long time but only now I had the caurage to comment. It’s pure glamor. This looks sooo fun and adorable! And cozy!! OK, done. Booking this treehouse this is just the best! These photos are so dreamy! Sounds like the perfect weekend getaway! Is this tree house handicap accesible? I would love to surprise my boyfriend with a trip there (or somewhere similar) but he uses a wheelchair secondary to a spinal cord injury. This looks like so much fun! Thank you in advance for the information! I aaaaabsolutely love this! So much so that I featured it on my Friday Favorites! But seriously, out of all your travel destinations (and y’all have had a lot of spectacular destinations! ), the Bolt Farm Treehouse is definitely my favorite so far. Such a cute, romantic idea and I can’t wait to book my own little getaway! this looks like such a lovely place to getaway. i have to check it out! glad you darlings got time to unwind a bit and disconnect. This looks like such an amazing place to spend a few days. Treehouses were the best when you were a kid, and turns out theyre pretty great as an adult too!! This looks so fun and like an amazing little escape from everyday life. I love all the outfits you brought as well, especially the last one with the skirt. So cute, a perfect outfit for spring (which I can’t wait for!). This treehouse is so adorable! It looks like the perfect getaway!